Despite the freezing temperatures and deep snow, nine adjunct faculty and staff members of the Kansas City campus met on an early Saturday morning in January to learn CPR, first aid and how to use an automated external defibrillator (AED). 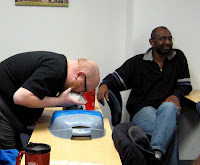 The training was provided by Kansas City First Aid, a local organization authorized by the American Heath Association. As the participants learned in the half-day session, training in first aid, CPR and AED can make a difference between a quick recovery and a long illness, and perhaps between life and death itself. Following the training, fully stocked first aid kits have been placed in the main reception and the faculty lounge areas. Students and visitors, who are having a medical issue, may contact staff in the front office or available faculty for assistance.